I’ve been encouraged to restart the Friday Fundamentals series and I think that’s a good idea. My upcoming series of articles about the J Frame revolver and how to get the most of it will be a good platform since the J frame can be unforgiving of poor fundamentals. People who learn to shoot a J Frame adequately can usually learn to shoot other handguns well. But first, let’s have a philosophical discussion about learning the fundamentals. Bottom line up front, as is often said in the business world. Most training classes are a condensation of much more training, practice, and skill development on the instructor’s part than their students will ever experience or be able to make use of. Only a few instructors use the term “feeding them with a firehose” but that’s what most training usually turns into, whether the instructor understands it or not. That philosophy doesn’t reflect the way adults learn. Distilling many hours, years, or decades of experience into a single half day, full day, or weekend class isn’t setting the students up for success. That’s especially true when at the end of the class, the instructor gives a certificate to the students and tells them they’re now ‘trained.’ Nothing could be further from the truth. ‘Indoctrinated’ would be a much better term. The lack of follow-on practice curricula is a major weakness in the training industry. It’s one of my major pet peeves about the way training is conducted. The NRA Training Department progression of Basics Of Pistol Shooting, Personal Protection In The Home, Basic Personal Protection Outside The Home, and Advanced Personal Protection Outside The Home are really the only exception to this situation in the industry. Some instructors will contest this and say they offer a series of classes. My rebuttal is that if the first class requires a holster, the students have already been led to the hydrant and positioned in front of the firehose. I like training new shooters. My colleague Grant Cunningham made a pertinent blog post about this shortly after I took the PPOTH Student Basic and Advanced Student Course. Experienced instructors often shy away from training the newest students. There has been a massive increase in people licensed to carry firearms over the past few years. In addition, several States have adopted Constitutional or Permitless Carry. That market base probably needs experienced trainers and coaches. And I don’t feel the need to reinvent the wheel. It’s unfortunate that the NRA Training Department’s best marketing statement for its Personal Protection training is contained in the PPOTH Instructor manual. “The NRA Basic Personal Protection Series is based on the building-block approach, moving from the simple to the complex.” The most effective training courses I have taken over the past two decades have used a step by step approach to skill building. The Training Department sees the progression of the courses for new gun owners interested in learning how to defend themselves and their loved ones as follows. NRA Basics of Pistol Shooting Course, the first course, develops the basic skills of handling, shooting, and cleaning the firearm, as well as a thorough grounding in firearm safety. employing point-shooting and multiple target engagement techniques. legal aspects of the use of deadly force in self-defense. In addition to the Courses themselves, the Training Department provides additional Skill Development Exercises for NRA Instructors to use with students after PPITH and PPOTH. And the NRA Marksmanship Qualification Program has even more exercises that interested shooters can use to increase their skills and earn awards from the NRA. Looking at all the topics covered, that’s a really comprehensive training program. Those who are interested in a defensive firearm as more than a talisman to ward off evil can really get a lot out of such a “Basic” program. There are a number of aspects of the NRA’s series that I really like. First of all, the classes are between 4 to 9 hours long. Because they’re constructed in modules, even the 9 hour classes don’t have to be conducted in a single day. Most people’s lives are quite busy and asking new shooters to take an entire weekend or even week of training is both difficult and sometimes counter-productive. The NRA’s program is really the only one in the industry that is built around the student’s capabilities and time constraints rather than a trainer’s weekend convenience. Mea culpa; I’ve done both the traveling trainer and hosting trainer routines, so I’m as guilty of it as any of my colleagues. It’s something I want to try a different approach to. There’s a place for both newer trainers and experienced trainers in the NRA’s Personal Protection Series. I’m very much looking forward to seeing how I can implement that. At the NRA Annual Meeting this past weekend, the NRA Education and Training Division conducted an update for NRA Trainers. The presentations and discussion rekindled my interest in the standards for students to pass the NRA Basics Of Pistol Shooting (BOPS). 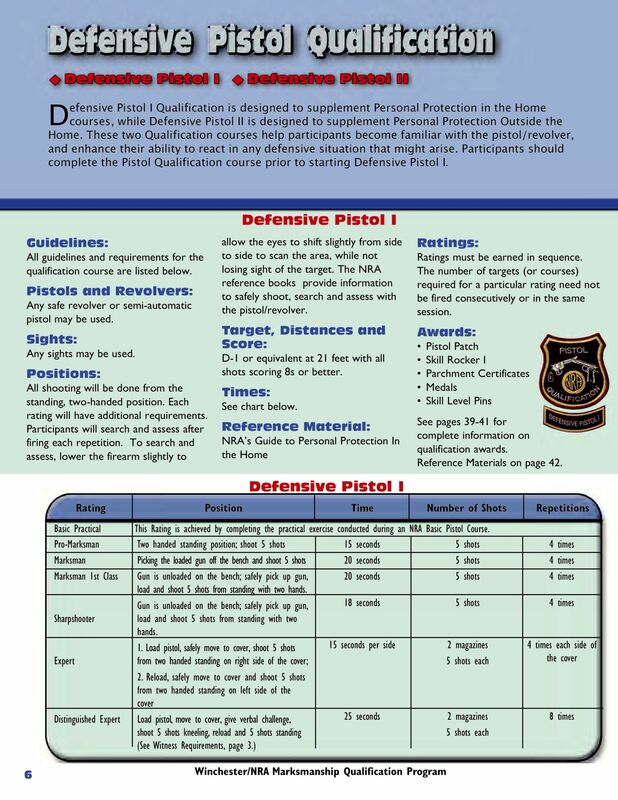 In short, there are four levels of qualification (standards) offered to the students at the end of the Basics Of Pistol Shooting Course. The very first level is Red, for which they must shoot a five shot group into a four inch circle four times at 10 feet. 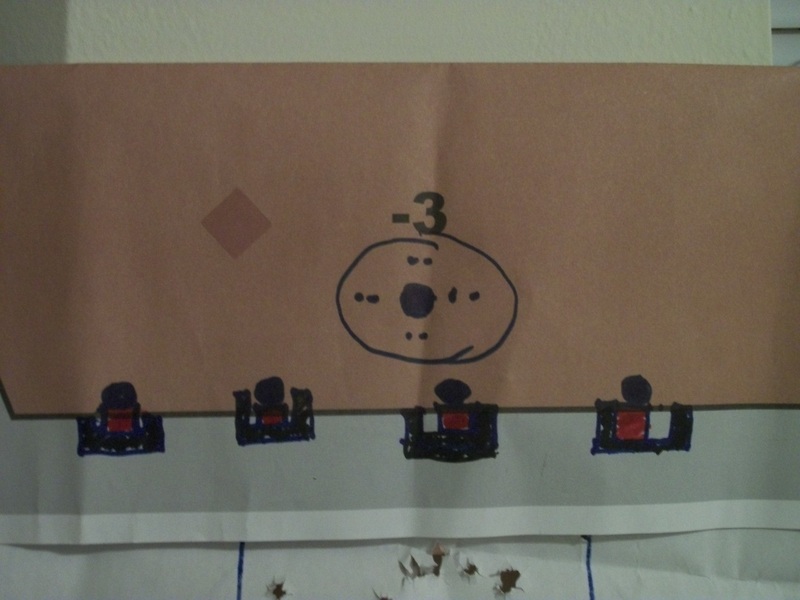 The four times don’t have to be consecutive but the students must be able to demonstrate the skill repeatedly so they can shoot four targets. Students who meet that standard are then offered the chance to attain three higher levels of achievement; White, Blue, and Instructor. 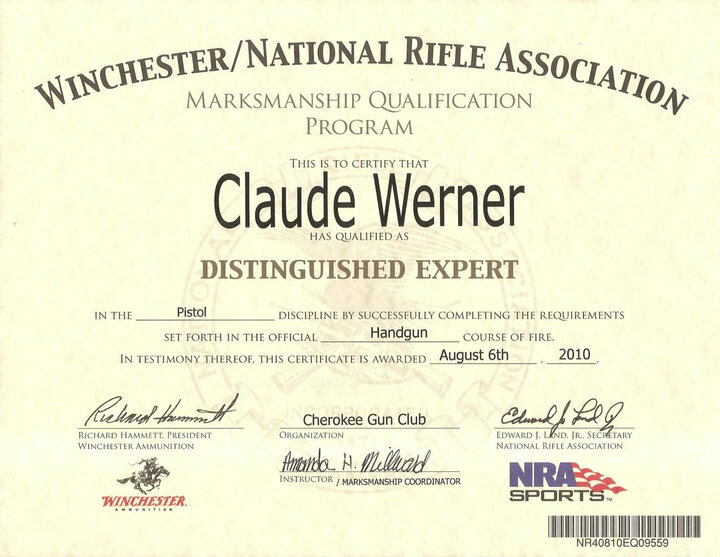 Achieving Instructor level Qualification does not mean that they qualify as NRA Pistol Instructors but rather that they have shot to the same standard that NRA Pistol Instructors are required to. 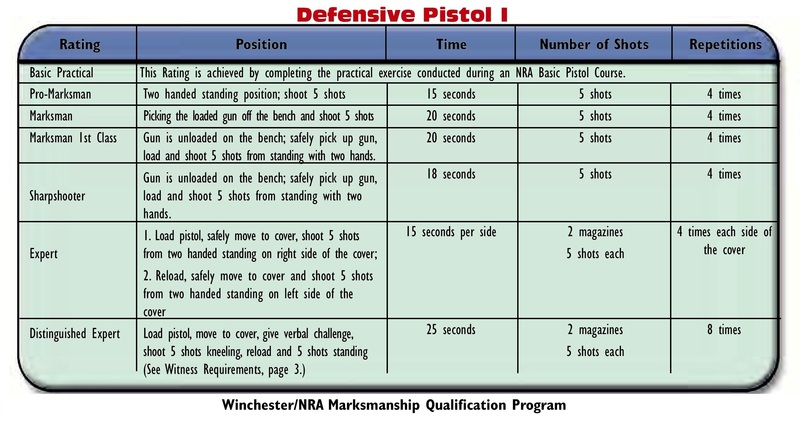 While many experienced shooters will say this is ridiculously easy, I say “NOT SO FAST!” Having run over 100 shooters of varying skill levels through the NRA Marksmanship Qualification Program Defensive Pistol I course, I know it’s not as easy as it seems. The 100% standard for group is the kicker. 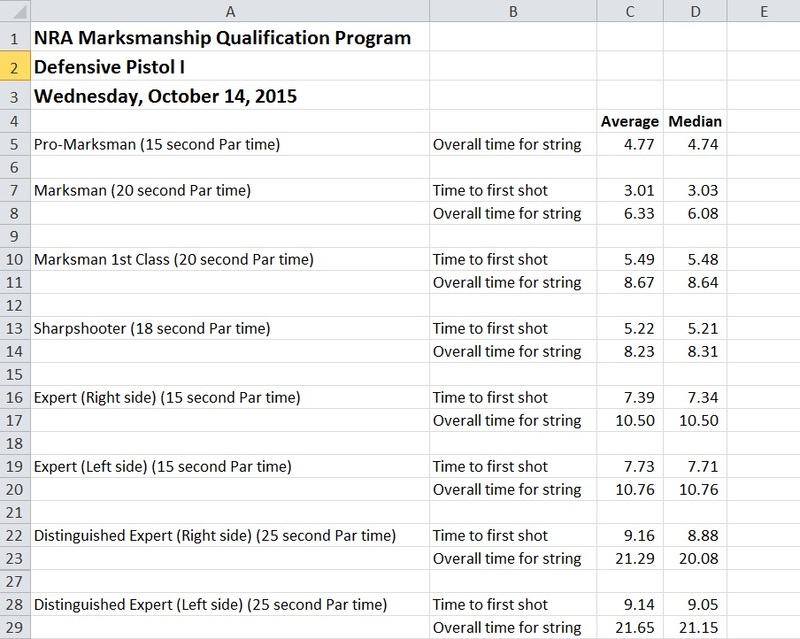 Out of my 100 or so testees, only 1 person out of 10 was able to pass the MQP DP I Pro-Marksman test on the first try. 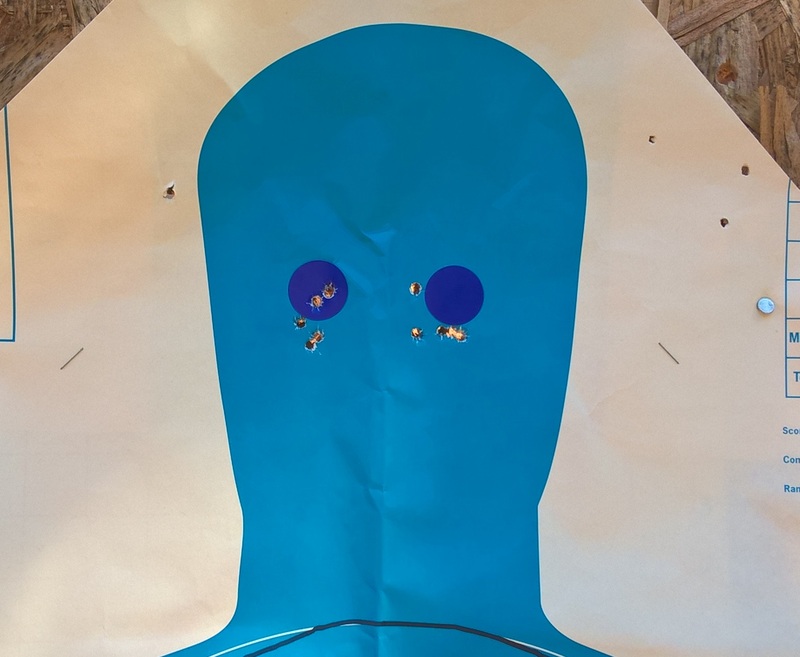 That standard is five shots into a 12 inch circle at 7 yards (21 feet), four times. Repeatedly shooting a four inch group at nearly the same distance is obviously quite a bit more difficult. 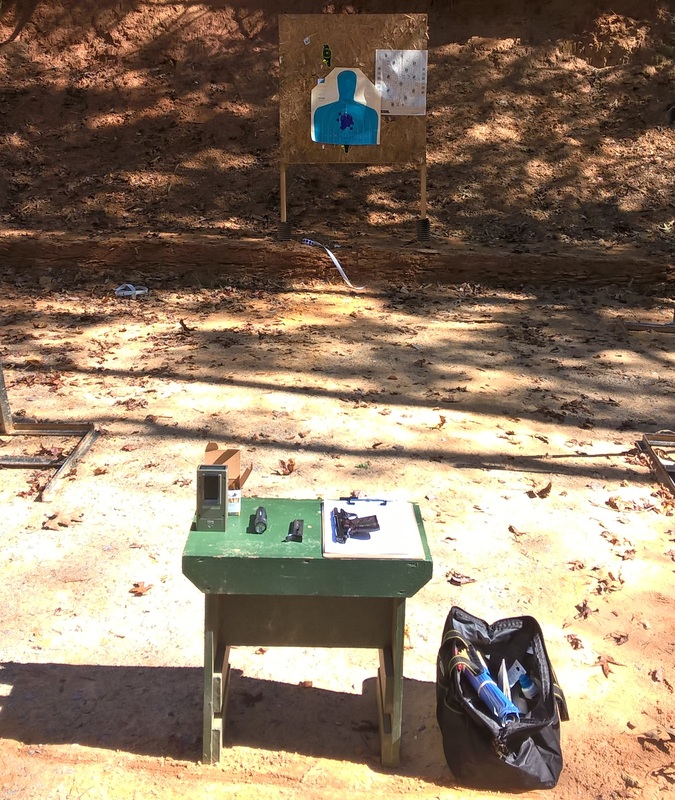 Moving up to the Pistol Instructor standard, how many people practice shooting groups at 15 yards? Very few in my experience. A six inch group at that distance can be a major difficulty if you haven’t practiced it. 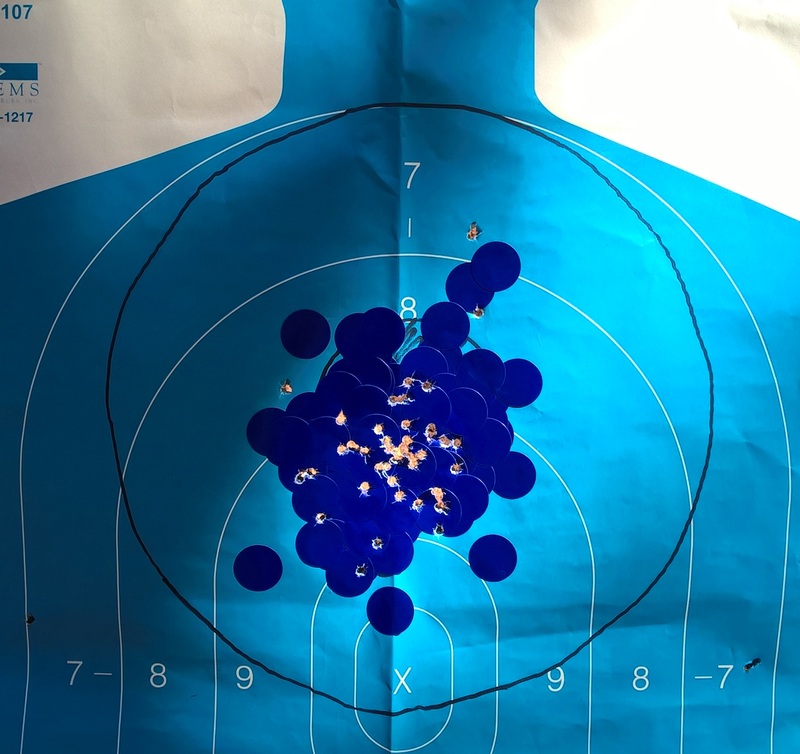 Having one try at putting 16 out of 20 shots into a six inch group at that distance can be an eye opener about one’s demonstrable skill level. I was able to pass all the levels but it required some concentration on sight picture, trigger press, and follow-through. What a concept! A PDF of all the targets is attached below. Print them out and take them to the range next time you go to practice. Your results may surprise you. Note that the targets print just a little small so if one of your shots is slightly out, as with my Blue #2, you’re still on the mark. If you can’t pass at the Blue level, perhaps you should consider taking the NRA Basics Of Pistol Shooting Course. You can search for courses local to you at NRAInstructors.org. Several Negative Outcomes were brought to my attention this week. One was yet another incident of someone shooting their spouse, thinking it was a burglar. She died as a result of one shot to the chest. The husband told police it was an accident. He told officers he woke up around 4:15 Saturday morning and heard noises in his house … He told investigators he grabbed his gun and when he saw a light on and someone standing in the distance, he took a shot. He said the person he ended up hitting once in the chest was his wife. This sad situation bolsters my contention that when we pick up a pistol at home, we have to pick up a flashlight at the same time. 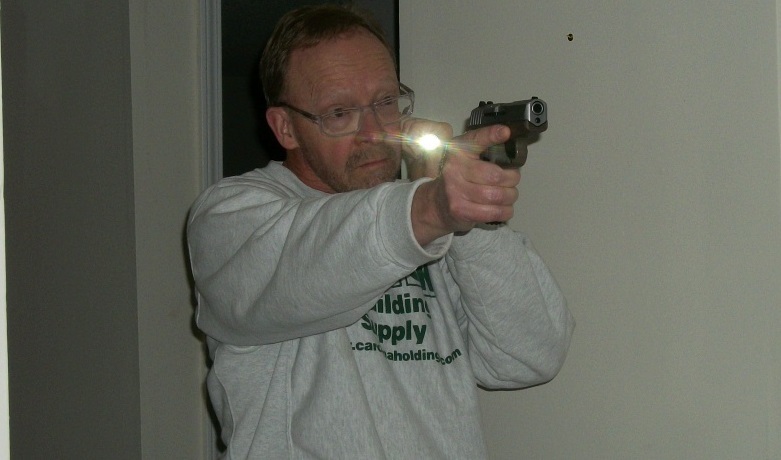 That’s why I made flashlight shooting an integral part of The Tactical Professor’s Pistol Practice Program. To get some repetitions in and reinforce the habit for myself, I went to the range this week and shot the entire NRA Defensive Pistol I marksmanship program using a flashlight. As a curiosity, I also used a timer instead of going by the PAR times in the program. The pistol I used was a Beretta Jaguar in .22 Long Rifle. Many in the industry poo-poo the .22 as a defensive tool but .22s have worked for me. An aspect of .22s I like in the practice context is that shooting several hundred rounds in one session isn’t punishing, either physically or financially. 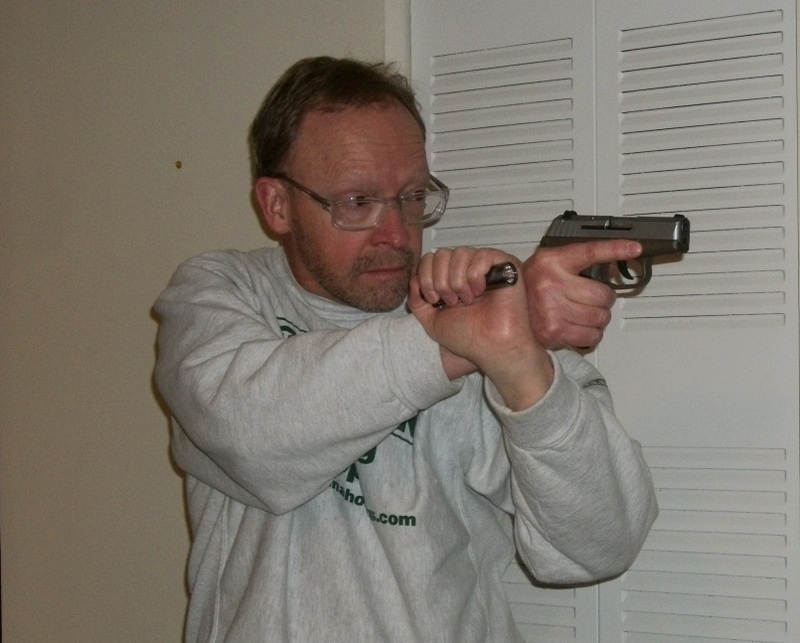 I shot it at my gun club but the way Defensive Pistol I is structured, it can be shot at just about any indoor range. That’s an aspect of the program I really like. What I did was to have my pistol, my flashlight, and the timer on a stool in front of me. The target was downrange at the specified seven yards. 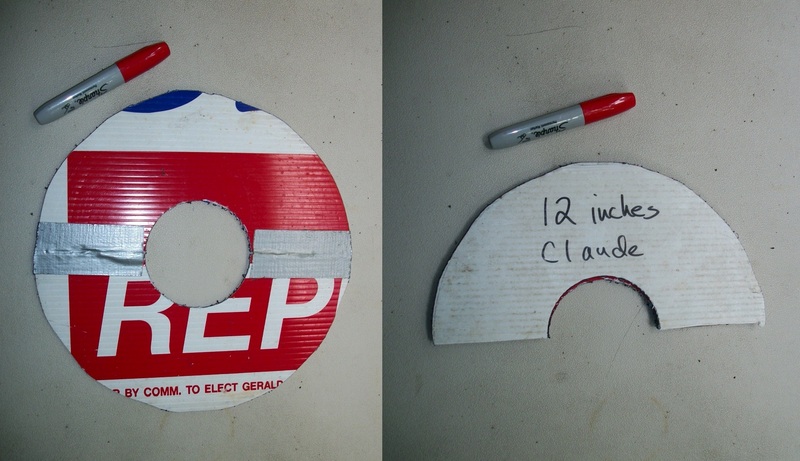 The target was a B-27 with the NRA AP-1 8 ring and X ring marked on it with a template. When the timer went off, I would pick up my pistol and flashlight simultaneously, assume the cheek position, and then shoot the specified string of fire. For the phases requiring loading the pistol on the clock, I picked up the pistol and magazine, loaded it, and then picked up the flashlight. After each string, I recorded my times. The NRA provides a scoresheet but it is set up for Pass/fail scoring, so I made my own scoring matrix. I checked the target after each string to make sure that I had the required 100 percent hits. 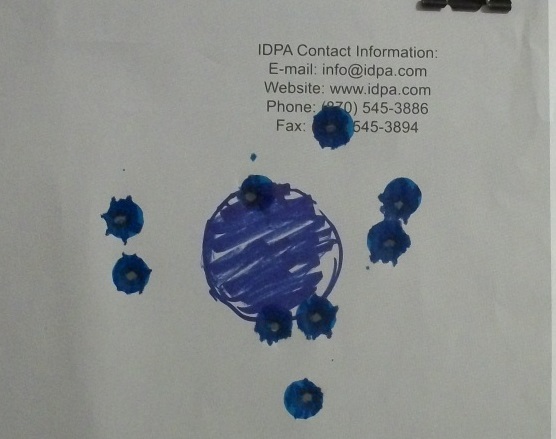 At the end of each phase; Pro-Marksman, Marksman, etc., I marked the target with blue dots to cover my hits. For most of the program, I used the cheek technique. The Expert and Distinguished Expert phases require shooting from behind cover. There weren’t any barricades readily available so I used the dueling tree in the bay to simulate cover. The Expert phase requires shooting around both sides of the cover. When shooting around the left side, I continued to use the cheek technique. When shooting around the right side, I used the Harries technique. The Distinguished Expert phase doesn’t specify shooting around both sides of the cover. However, it does requires eight runs instead of four, so I shot four around the right side and four around the left side. I was able to maintain the 100 percent standard and got a good idea of my times to accomplish each Phase. To finish off the day, I used the dots to create some eyes on the target. Then I shot a couple of groups at five yards. Getting in relevant practice isn’t necessarily hard; it just requires a little creativity and forethought. Part I of this series focused on Dryfire Practice. 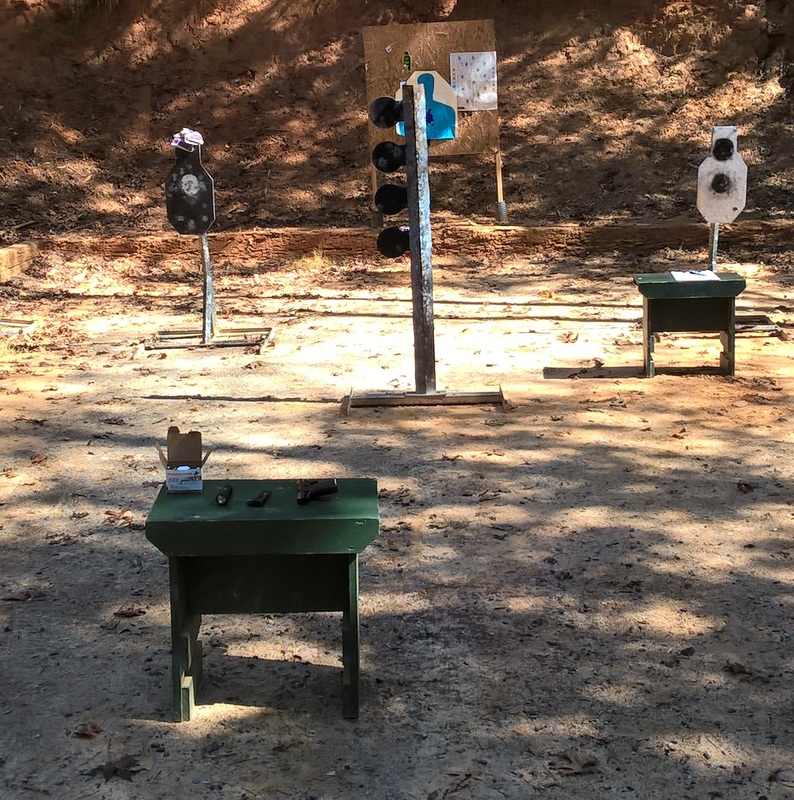 Now let’s focus on livefire practice, especially for those who are new to pistol shooting. To learn, maintain, and improve physical skills, we have to practice them regularly. We also need a plan for how we are going to practice. In that regard, shooting a gun is no different from learning to throw or hit a ball. The problem many people have is that when they go to the range to practice, they have no plan and use no structure. At least a motivated police officer has the course required for periodic qualification as a structure for practice. Competitive shooters have courses of fire, either for Classification purposes or something that was appealing in a match. Few Private Citizens have either of these, which is why the most common ‘practice’ is blasting 50 holes in a silhouette at 5 yards. Shooting a bunch of holes in a silhouette gives familiarity with recoil and muzzle blast but not much else. Something further is needed to develop skill. A very good starting point for new shooters is the NRA’s Marksmanship Qualification Program, which is really a marksmanship development program. This is a self-paced and self-administered program that the NRA has made available for decades. There are a number of different courses of fire available within the Program. The one I recommend for those who have just purchased a pistol for personal protection is Defensive Pistol I. DPI is designed to improve skills that contribute to a successful home defense. Something I really like about Defensive Pistol I and II is that the accuracy standard is 100%, not a fraction thereof. The allowable area and time limits are generous but you have to make every shot count. As I mention periodically, every bullet you fire in an urban area that doesn’t hit your target is heading for a busload of nuns and orphans being followed by a limousine full of personal injury lawyers on a conference call with the District Attorney. We have to get used to the idea that the only safe backstop for our bullets is the criminal’s body, period. The target area specified for the NRA program is the 8 ring of the NRA D-1 (Bianchi Tombstone) or equivalent. The 8 ring of the D-1 is 12 inches in diameter. The shooter must place five shots in the 12 inch circle at 7 yards within a time limit of 15 seconds. Many shooters I talk to think this is a very simple marksmanship task. The reality is that because of the 100% standard it’s not as easy as people think. In order to meet the standard for the first level (Pro-Marksman) of the program, the task has to be done four times. Therein lies the rub. I have run over 100 people through the program and only about 10% have passed on the first attempt. What happens is that on one or two runs, one shot will not hit the 12 inch circle. Sorry, you didn’t make it. The good news is that the four runs don’t have to be done consecutively. If you mess up a run, just shoot another until you have four that meet the standard. My experience has been that 10 percent of shooters can do it in four runs, another 40% will make it in five runs, another 40% will make it in six runs, and the final 10% need a lot of coaching to get through it. While the Tombstone target isn’t available at all ranges, the allowance for an ‘equivalent’ means you can make a template of the 8 ring and apply it to whatever target is available. Just take your template and a marker with you to the range. I cut mine in half and then taped the halves together with duct tape so it folds and fits easily in my range bag. 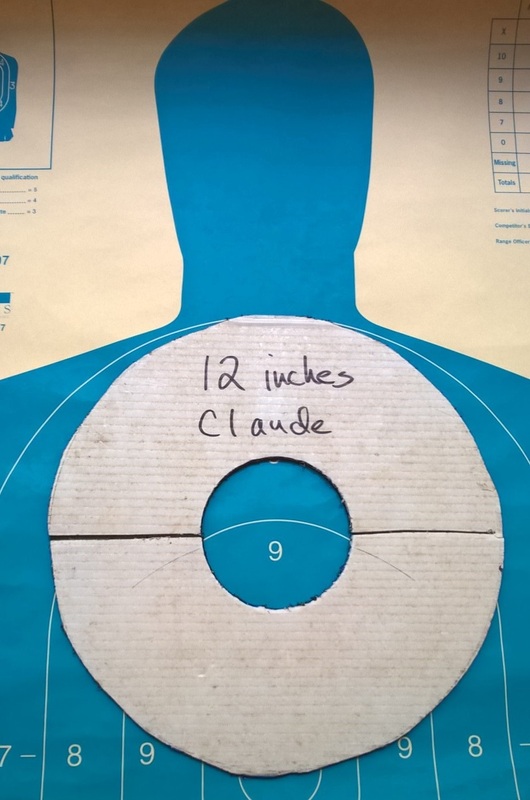 Once you get to the range, outline the template on your target and you’re ready to go. Be sure to take some kind of tape or marker with you so you can mark each run. Marking each run is how you learn to shoot well. As a general rule, I mark my targets after no more than 10 shots. 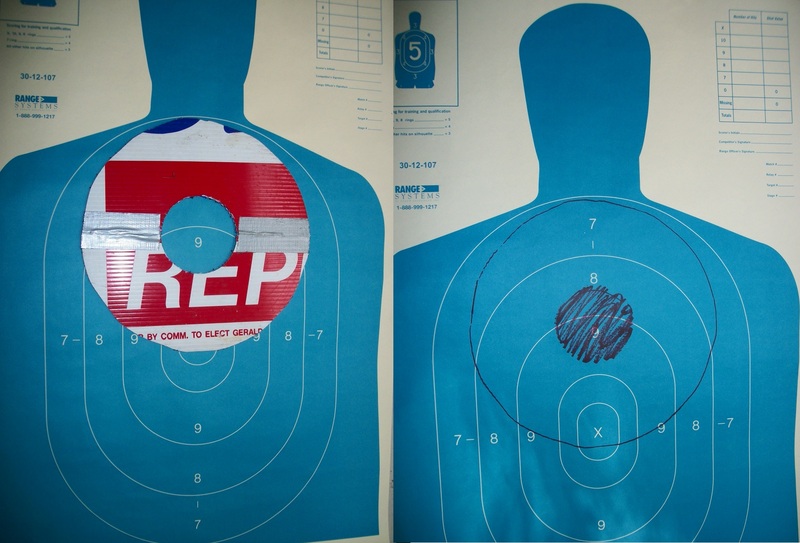 When doing this program, you should mark your target after each string of fire, i.e., each five shots. A new shooter can structure their practice sessions in many ways. What’s important is to plan what you do before you go to the range so you don’t waste your time and resources. The NRA program appeals to me because it’s already made up, it contains relevant skills, and it’s workable at most indoor ranges. There are also awards available from the NRA for participating in the program. NRA membership is not necessary to participate. 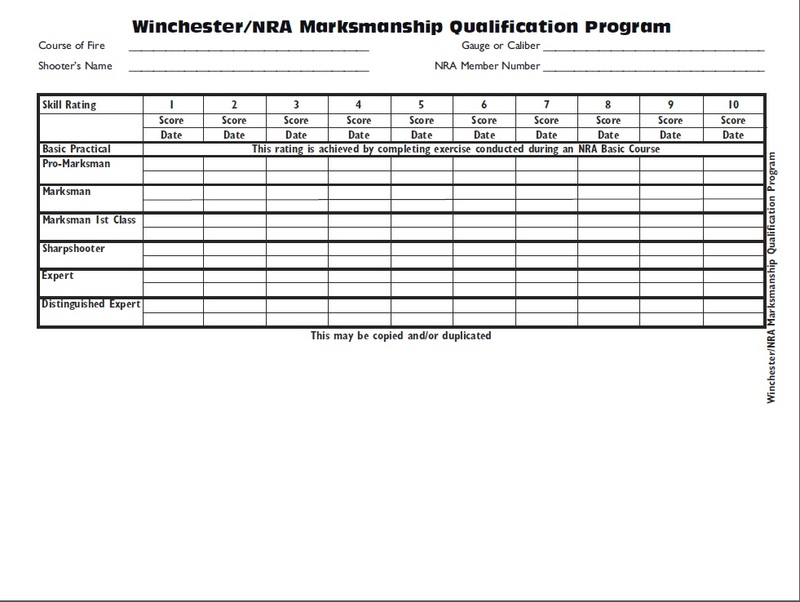 The NRA Marksmanship Qualification Program Booklet explains the entire program in detail. It is available for download from the NRA Training Division’s website. While I was teaching a private lesson last week, my student was struggling with improving his times, while maintaining an acceptable degree of accuracy. I could tell by the size of his groups, which were quite small, relative to the speed he was going, there was a fundamental that he didn’t understand. The front sight does not have to be perfectly aligned in the notch to produce good hits. So, I had him do a drill to demonstrate the acceptable degree of sight misalignment that will still result in hits on target. The drill is to fire the pistol with the front sight on the target but with the rear notch deliberately misaligned. It is conducted in four parts consisting of two shots each. This is the diagram I drew to show him what it should look like. The front sight is aligned correctly on the target with the misalignment done to the rear sight. I prefer to use a dot as the target to get the most graphic result. In this case, I used a 1 ¾ dot. There’s no magic to that number; it just happens to be the size of the template I had. I had him shoot the drill at seven yards. This was the result. His group measured about four inches at that distance. For many people, trigger manipulation issues will have a greater effect on their accuracy than will sight alignment. Once he understood that he didn’t need a perfect sight picture, the speed of his shooting picked up and his accuracy remained well within acceptable limits. As long as the front sight is close to the center of the target, a certain degree of misalignment will still produce a good hit. Not worrying about getting a perfect sight picture will result in a noticeable increase in speed.